It only takes a minute for a burglar to break into your home when you lack a sufficient security system. To avoid becoming the next victim of a property crime, you need to take extra steps to secure your home. This is especially important if you have, or are considering installing, sliding glass doors. Burglars often choose homes with these systems, as they know that such doors are often unsecured, creating an easy access into the property. Many sliding door systems have simple latches that an intruder can easily open. Oftentimes, it is just a case of shaking the door. Simply adding a better-quality lock barely helps, as intruders can just as easily break the glass or push the panels off their tracks. This takes a little longer, but it’s no problem for an experienced burglar. How Does Cover Glass Protect Your Home Against Intruders? Our standard locking hardware is much more robust than what you find in other sliding glass doors. It consists of two deadbolts: one at the top and one at the bottom of the first opening panel. Unlike other systems, there are no floating handles, just glass. This means that it is impossible to enter from the outside. This creates increased security while taking nothing away from the appearance. We also offer nonstandard options for homeowners who would prefer to have a handle or want key entry access from the outside. Another choice is a lock on every panel. You can pick the solution you feel the most comfortable with for security reasons and to match your lifestyle. As you saw above, a locking mechanism alone is insufficient to protect your home from intruders. For this reason, we combine the locks on our doors with extra-strength glass. This also protects your home from flying golf balls. Our panels are made from two sheets of tempered glass (also known as safety glass) separated by industrial lamination. Each panel is between ¾ inch to ½ inch thick, up to five times stronger than regular glass, and virtually unbreakable. When we put our secure sliding glass doors to the test, we were unable to break the glass, even when punching, kicking, and smacking the panes with a hammer. One of the most important features of the Cover Glass system is that we install our panels from the top hung glass position. How does this ensure your protection? Top hung sliding doors cannot be pried off the tracks or lifted out of alignment, which protects against possible forced entry and positive/negative wind pressures. This is a unique feature that many sliding glass door contractors don't provide customers. Instead of top hung systems, other companies will use a bottom rolling system, which leaves your vulnerable to being pried or lifted out of alignment. The benefits of the secure sliding glass doors from Cover Glass don’t end with security; there are several other advantages to our systems. An open floor plan is ideal for enhancing the feeling of space and openness in your home. The Cover Glass system transforms an entire wall into glass, creating a sense of connection with the exterior. This helps your home seem even larger and more welcoming. Due to their high quality, Cover Glass systems increase your property value. In contrast, a standard system that jeopardizes home security may reduce market value. The glass in our top-hung sliding glass door systems is all Low-E (or low-emissivity). This means that even panel has a special coating to filter UV rays. Light is able to enter your home as normal, but heat is reflected. This stops your home from heating up, reducing your energy bills. Our sliding glass doors are all Title 24 compliant. In other words, Cover Glass systems offer high energy efficiency and preserve outdoor and indoor environmental quality. In the rare case that a glass panel in one of our sliding glass door does break, the lamination means that it will not shatter. Instead, the pieces will hold together, which prevents accidents. 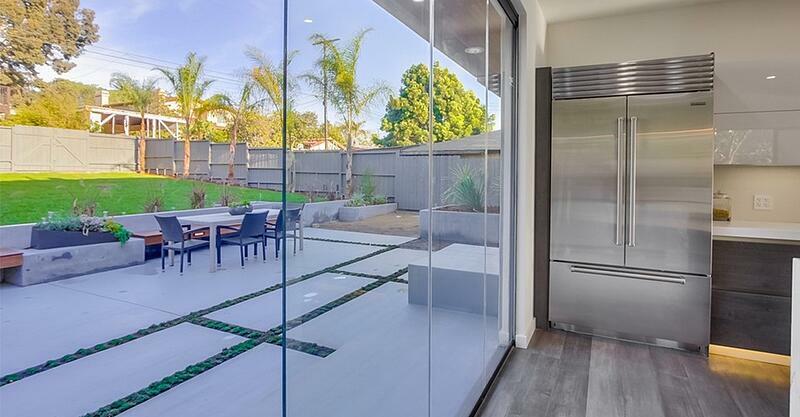 Our sliding glass doors are frameless, creating a seamless transition and enhancing views. 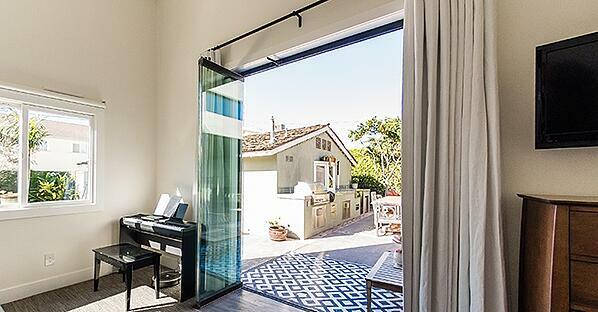 The Cover Glass sliding glass doors glide open in an effortless movement that you will love. There’s no reason to forgo sliding glass doors for security reasons. The Cover Glass system provides you with secure sliding glass doors to protect your home from everything from intruders to mishaps. While the tempered glass keeps your home safe from flying golf balls, the design of the doors means that panels stay firmly in their tracks. It is impossible for intruders to break in through a Cover Glass system and, unless you choose otherwise, your glass doors will only lock from the inside. In addition, lamentation creates a sound barrier to promote peace and quiet in your home — no more disturbances from noisy neighbors. By choosing a safe and secure system from Cover Glass, you will keep your family protected and your home comfortable. 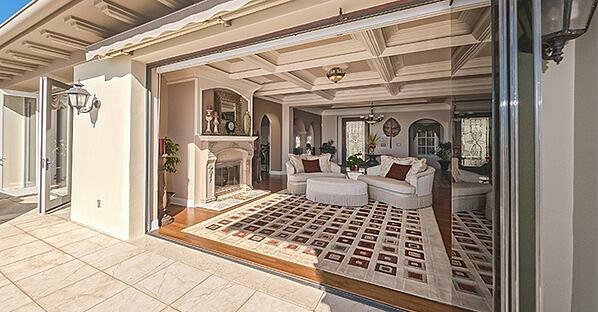 Do you want to install beautiful and secure sliding glass doors?